Each year, a ton of games are made and released in Japan. But many of them don’t come out in the rest of the world at the same time—and others never leave the island nation at all. So with that in mind, here are the best Japanese games of 2015 that have yet to come west. Why It’s So Good: Yamowari is the emotional story of a little girl traveling the streets of a Japanese town at night as she hunts for her missing sister—and is in turn hunted by spirits and ghosts eager to murder her. Classic survival horror gameplay at its best, this game still somehow manages to be cute and scary at the same time as we see a child learn about death and overcome her fears for the sake of someone she loves. Is it coming to the West? There’s no word on a Western release. 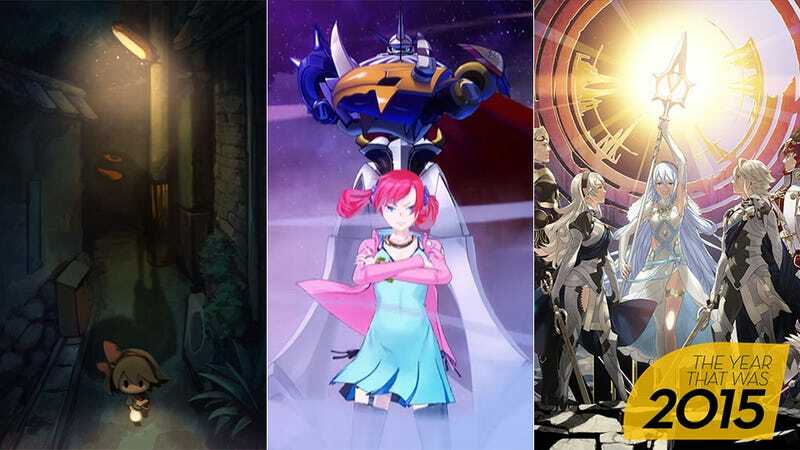 Why It’s So Good: With a cast of Digimon 200 strong, Digimon Story: Cyber Sleuth is a game fans of the long-running anime will love. More than that, it’s an excellent JRPG that mixes its “save the world” plot with everyday private detective mysteries for the digital age. With great characters and fun, addictive gameplay, it is not a game JRPG or Digimon fans should miss. Is it coming to the West? Yes, on February 2, 2016, for North America and February 5, 2016, for Europe. Why It’s So Good: Hatsune Miku is the breakout Vocaloid virtual idol, although she is far from the only one. IA/VT Colorful shows off IA and many of her best songs. If catchy J-pop and the Project Diva games are your thing, this one is definitely worth an import even if you don’t speak Japanese. Is it coming to the West? No. Because of music licensing issues, you’ll have to import this one to enjoy it. Why It’s So Good: Fire Emblem Fates is the story of a princess (or prince, if you so choose) kidnapped and raised as a member of an enemy kingdom. Conquest is the version of the story that follows this princess as she elects to stand with her adopted family in a war between the two kingdoms. Thematically, it’s all about what truly makes a family as the princess and her siblings try to curb the machinations of their evil father while protecting their kingdom from invasion. In battle it is more of the Fire Emblem gameplay you’ve come to know from previous iterations in the series—so in other words, it’s some of the best SRPG gameplay out there. Is it coming to the West? Yes. It’s scheduled for release in North America on February 19, 2016, and in Europe and Australia sometime in 2016. Why It’s So Good: The Best + is the perfect title for this game. It takes the best rhythm mini-games from the Rhythm Heaven series and gives them a 3DS facelift. But more than that, about a fourth of the mini-games are completely new—and that of course includes a whole new smattering of the series’ always amazing remix stages. Why It’s So Good: Taking place in the early 1900s, Dai Gyakuten Saiban follows the grandfather of our favorite ace attorney, Phoenix Wright, as he travels from Japan to England and teams up with Sherlock Holmes to solve mysteries. While many of the basics of the Ace Attorney series remain, this one makes the most of its low-tech setting and foreign locations to mix up both the investigations and the courtroom drama. Why It’s So Good: Taking place before the true end of the original Steins;Gate, Steins;Gate 0 is the untold tale of a broken version of its lead character as he tries to put his time travel adventures behind him—even as the world moves closer to an armageddon only he has the power to prevent. While it doesn’t quite live up to the first game, it is still a fantastic follow-up. The main storyline is solid and it weaves a tale of mystery and suspense spanning different timelines while at the same time relates a personal tale of just how hard it can be to come back from emotional devastation and personal loss.